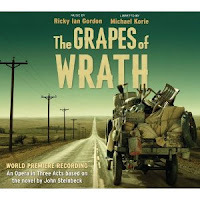 Tonight I am attending Collegiate Chorale's concert of The Grapes of Wrath, at Carnegie Hall. The music is by Ricky Ian Gordon and the libretto is by Michael Korie. Oh my goodness, have a marvelous time! Can't wait to hear about it -- and best wishes to our young important friend! Did Korie change it from "Rose of Sharon," or was that a typo in the program? Hi Sibyl, Rose of Sharon is from the book; on the screen, the subtitles were written phonetically. I went to see it...thought that Victoria Clark as ma Joad was amazing. Loved christine Ebersole as Mae. I thought the young boy, Alex Schwartz, had a beautiful voice. I wish he had more lines.